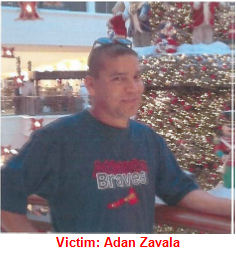 One year ago, on October 24, 2016, at approximately 9:31 p.m., the victim Adan Zavala a 48 year-old Latin male, was shot and killed in the breezeway of the Courtyard Village Apartments at 9747 Forest Lane Dallas, Texas. At this time, homicide detectives are seeking any information on this murder. A suspect vehicle was seen leaving the crime scene. The suspect vehicle appears to be either white or gray in color, and appears to have black wheels or no hubcaps. If anyone has information regarding this offense contact Homicide Detective S. David, #4559, at 214-671-3627 or steven.david@dpd.ci.dallas.tx.us Please refer to Dallas Police Case number 255991-2016.